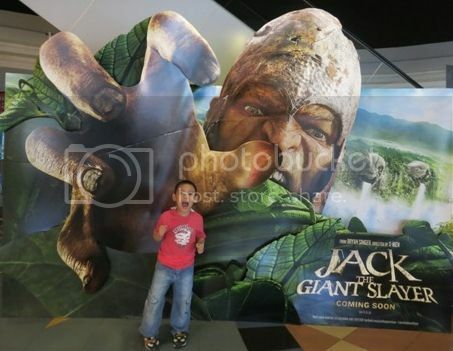 We watched the 3D movie Jack the Giant Slayer at Robinsons Movieworld in Robinsons Galleria last Saturday. Of course, the little boy went with us as he didn’t want to be left behind. Jack the Giant Slayer is based on the classic fairy tale Jack and the Beanstalk. They altered the story a bit, though. The movie tells the story of a young farmhand named Jack (Nicholas Hoult) who must rescue the brave princess Isabelle (Eleanor Tomlinson) from a race of giants after unknowingly opening a gateway to their world. This reignites the ancient war between men and giants as the giants try to reclaim the land they once lost. As for me, I managed to finish the movie without falling asleep. That’s because I was also munching on two different popcorns inside the movie house. If you want to be entertained, then you should see this film. It was a fun movie to watch, and I liked these three actors— Nicholas Hoult, Eleanor Tomlinson and Ewan McGregor (captain of the Guard)—but the film wasn’t really something to rave about. Story-wise, I actually like Jack and the Beanstalk better than Jack the Giant Slayer. Jack the Giant Slayer was directed by Bryan Singer and released by Warner Bros. It’s still showing in movie theaters in Metro Manila. This entry was posted in Jack the Giant Slayer, Movie Review. Bookmark the permalink. Ykaie and I will put this on our must-see movie. Is it still showing at the cinema? I only know the story of Jack and the Beanstalk. I’ll try to catch this on DVD. At what age did your son first watch a movie? ← We Went Strawberry Picking in Baguio!